Tired of shoddy connectivity with the mobile network not available error message popping up every time? Here’s everything you can do to make sure that the issue doesn’t get in the way of your phone calls. Mobile network in the early days of telecommunication was something that was entirely used to make phone calls. As the industry developed, so did different means of communication through SMS, and multimedia messaging caught up with the consumers. Eventually, the power of the internet took over, entirely reshaping the way we communicate with each other effortlessly. While the mobile network industry is making strides with promising technologies such as 5G network, Android devices still suffer from poor network connectivity at times. If you’ve been using smartphones long enough, you’ve unmistakably come across the mobile network not available error message quite often. Whether it popped up while you tried to make phone calls or simply when loading web pages, it does happen. This can be especially annoying when you’re in the middle of something important, and sometimes you can’t even find an apparent fix to the issue. Each and every time you’ve experienced networking issues with your Android, the missing mobile network error is bound to appear. The tricky part about the mobile network not available issue is that there’s isn’t a sure-shot fix for it. 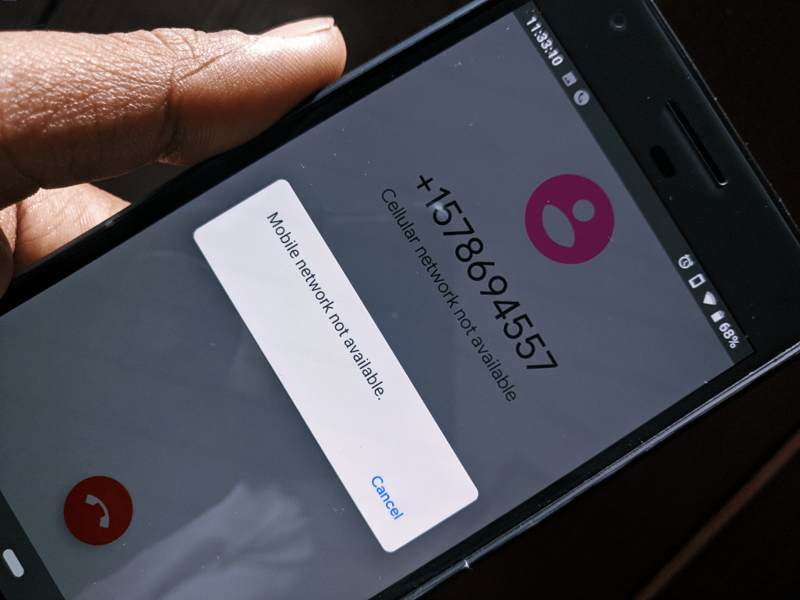 The problem lies with the fact that the error can occur not just because of the phone, but the SIM card or the carrier’s network signal as well. Either way, we’ve gathered together a bunch of tried and tested methods that will help you resolve the networking issue. While most regular mobile users may know about this trick already, it is far too useful to be skipped over. 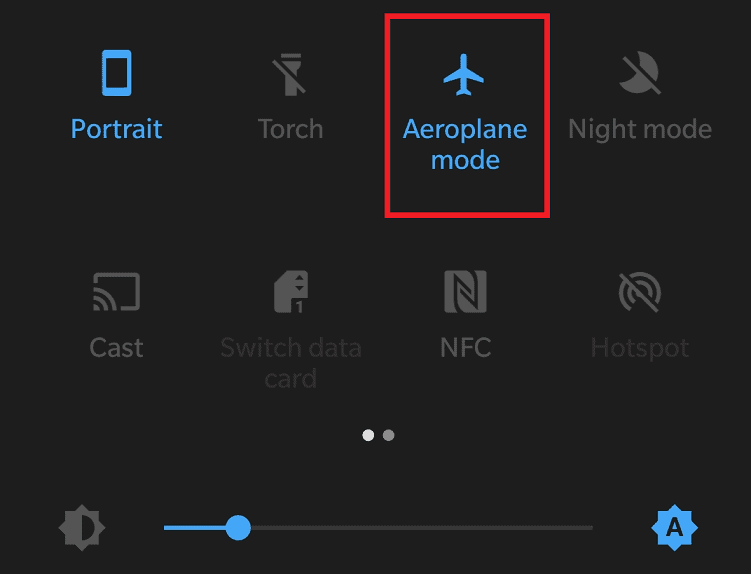 The Airplane Mode feature may be originally designed to make it easier for you to use your phone while in-flight, but it is generally quite useful. Each and every time you toggle on the Airplane Mode on your Android device it resets the wireless connections automatically. This includes the Wi-Fi network, Bluetooth connection, and even the network connection, making it an ideal solution to start with. From any screen on your Android device, slide down to view the notification shade. Tap on the Airplane Mode icon to enable it. Under normal circumstances, this will trigger the phone to look for the network signal once again and likely solve the mobile network not available error for good. However, if this doesn’t seem to happen, just keeping going and move on to the next solution down below. It may seem like a fundamental tech support question to turn off and on your device, but it does work. 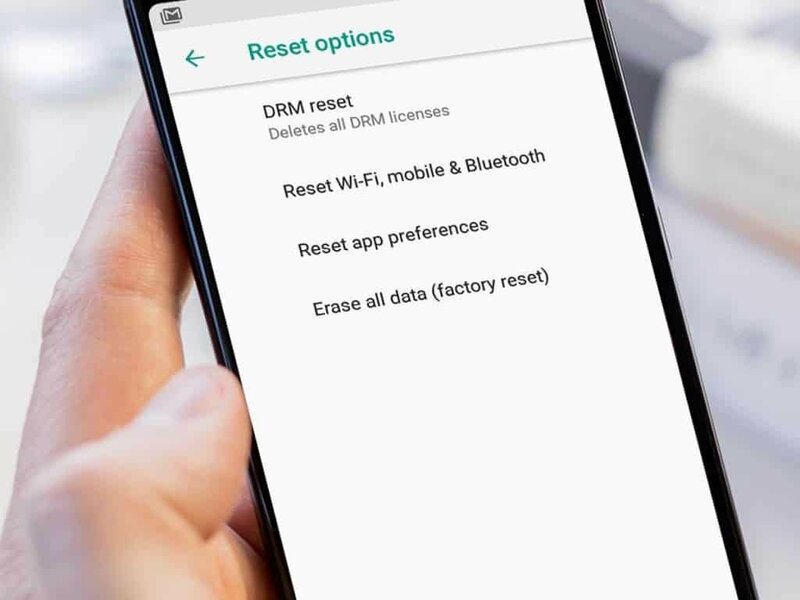 Whether the error started popping up after a certain app crashed or you can’t simply find a proper network signal, simply restarting might just be all that you need to do to fix the issue for good. Press and hold down the Power button on your Android device until the boot pop-up window is displayed on the screen. Depending on your device, select the Restart or Reboot button and wait while the process completes. Once your Android device reboots, check to see if the Google app or service that was giving back the error message has now been resolved. However, if you’ve tried this method and the missing mobile network error still pops up, head down below. For those who aren’t into the technical mumbo-jumbo of how mobile network works, there are different frequency bands for signals. GSM network (2G signal), WCDMA (3G signal) and LTE (4G signal), all work on different frequencies. Since your device scans through different frequencies to find you the most reliable connection, it can cause network drop issues. 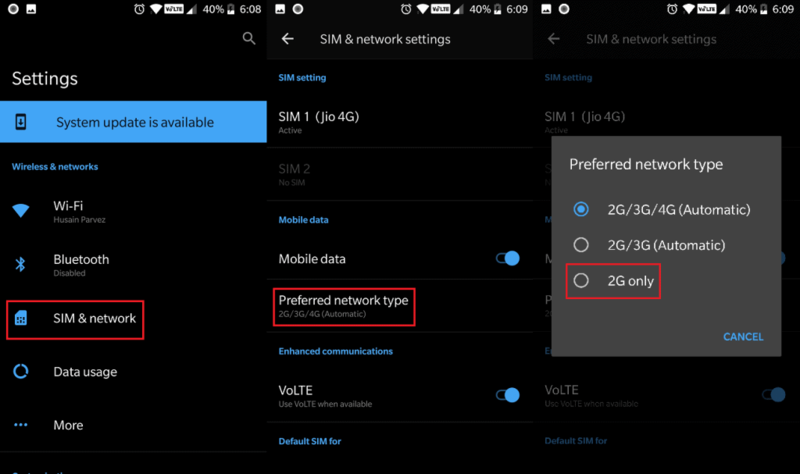 Fortunately, Android comes with the ability to help you choose between the available network modes (2G, 3G, and 4G networks). To improve your signal strength in times when you need to make an urgent phone call or send out a text, you can try switching the Network Mode momentarily using the Settings app on your mobile device. Navigate through to find the SIM & Network or Connections tab in the Settings app and open it. If you have multiple SIM cards in the phone, select the one you’d like to change the network mode for. Tip: Select the 2G only option to get network connectivity right away if you want to make phone calls or send out texts. Toggle the Airplane Mode on and then off to refresh the network changes and proceed further. Remember, changing network mode of the SIM card to 2G means that you won’t be able to enjoy high-speed internet. Once you’ve solved the mobile network not available issue, make sure you switch back to the Automatic settings in the Network Mode so that your internet connection quality is restored. It might feel like a letdown that your all-powerful Android device is sometimes crippled with no connectivity. However, the silver lining is that the Settings menu offers you multiple ways to tackle the problem of low connectivity. Thanks to the ability to manually select your network operator, you can solve the no mobile network issue almost instantaneously. Find the Network operators tab from the list and open it. Tap on the toggle switch next to Choose automatically to disable it. Wait while the mobile searches for available networks and then tap on the name of your network carrier. You will be able to see a pop-up message reading “Registration complete” at which the compatible mobile network should be available. You will be directly connected to the preferred network and the device won’t have to cycle through different frequencies. This is a sure-shot way to make sure that you get your signal bars immediately, so you can start making phone calls and send out texts right away. The interconnection between the mobile network issues and system updates may not be direct, but it certainly exists. Network carriers are always evolving their telecommunication technology and there are software updates from the manufacturer-end that are needed. Before you lose your mind over the spotty internet connection or no network connectivity for calling, make sure that your phone is up to date with the latest software version. Head over to the Settings app on your Android phone. Download and install the latest software updates and reboot your phone. Once you have the software updates installed on your phone, check to see if the mobile network issue is resolved. You may be fixated on the Android device is the culprit behind the mobile network not available error. But the truth is that the issue can be caused by the network carrier’s SIM card as well. 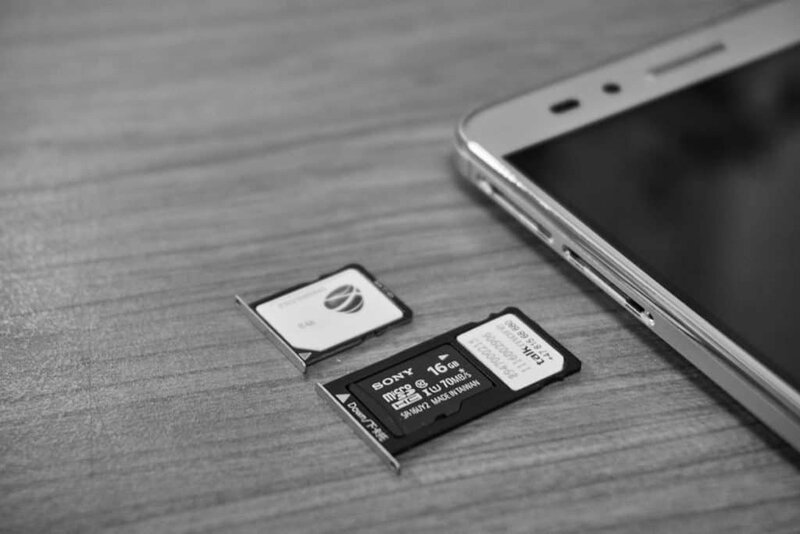 There’s a decent chance that the SIM card is damaged or simply unable to connect with the device’s network module. Either way, swapping out the SIM card and rebooting the device can work wonders for the network issues for you. Press and hold the Power button to turn off your mobile phone. Using a SIM ejector pin, pull out the SIM tray from your Android. Blow air into the SIM port but make sure that no moisture makes it way in. Insert the SIM card tray back into its slot and turn on the phone by pressing the Power button for a few seconds. Your Android device handles Bluetooth, Mobile Network, Wi-Fi and even Radio signals at once, along with NFC too. All of this networking on such a small device is bound to cause signal interference, causing network issues to arise. One fix that several experts have outlined is turning off is accessing the hidden Phone info menu in Android. By using the Phone info menu, you can conveniently turn off the Mobile radio power in hopes to fix this grave problem for good. On your Android device open the Phone or Dialer app from the home screen. Using the virtual keypad, enter the following number – *#*#4636#*#* to open the hidden diagnostics menu. Tap on the Phone Information menu and then choose GSM auto (PRL) from the Set preferred network type drop-down menu. Tap on the option you see and make sure that the radio setting is disabled. Now exit the Phone info menu screen and reboot your phone to bring the changes into effect. If all of the solutions you’ve been trying, continue to falter, refreshing the network settings is the way to go. 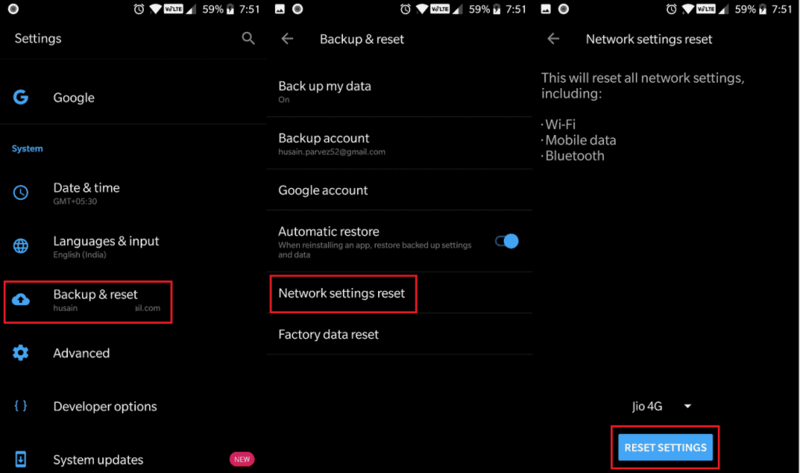 A precursor to factory resetting your device entirely, this option helps you clear out the saved preferences for your Wi-Fi, Bluetooth, and Mobile Network settings. In the event where nothing else seems to get rid of the mobile network not available issue, perform a network reset. Fid the Network settings reset tab and open it. If you have multiple SIM cards on the device, select the one you wish to perform a network reset on. Press the Reset Settings button and wait as the process completes. 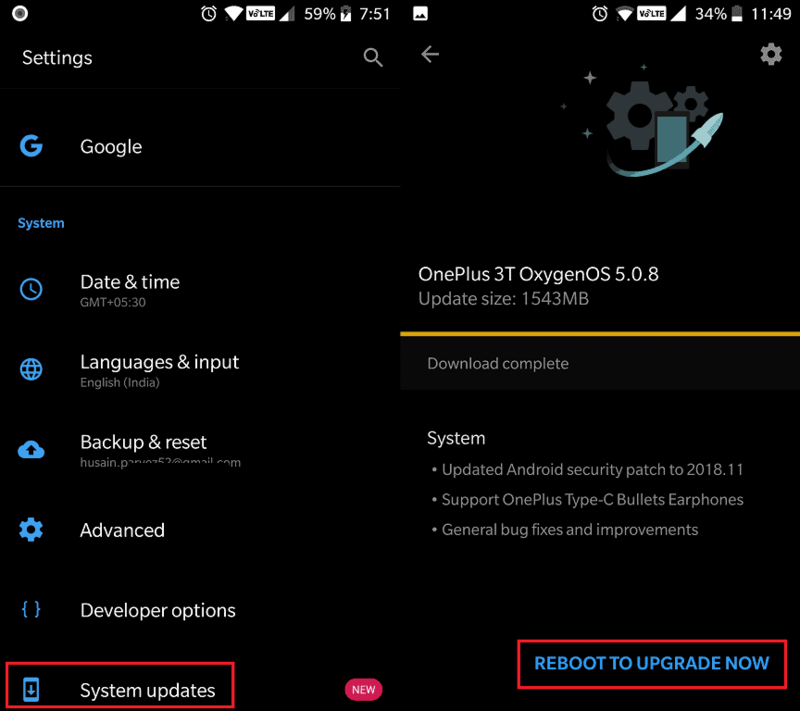 Once the network settings for your device have been reset, reboot your Android to refresh everything and start again. In rare circumstances where you still can’t get rid of the annoying mobile network not available error that pops up, there’s only one solution. You will need to factory reset your Android entirely in the hopes that the network issues will be fixed. A clean format should set your Android device straight and remove the error from surfacing again. Turn off the device, and then press and hold the VolumeUp and Power button simultaneously. As the age of 5G mobile devices is upon us, the problem of low connectivity should be a thing of the past soon. However, modern 4G LTE network connections with features like Voice over Wi-Fi have already made communication widely better. However, you cannot eliminate the physical factors affecting any network connectivity issue on Android. Whether you’re living in the big city where the concrete jungle is blocking away the mobile signal, or in the secluded farmlands where the network connectivity is spotty, the mobile network not available may not be fixable at all in some cases. Under such circumstances, your only solution that remains could be switching SIM cards with a preferable network carrier. 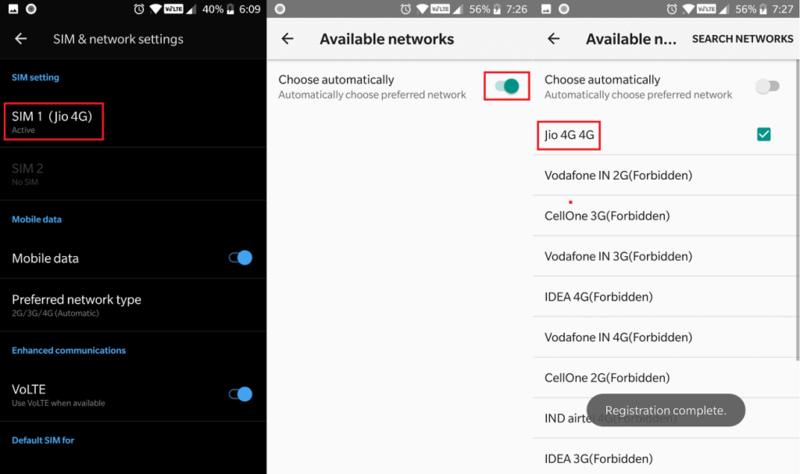 Were’ you able to counter the no network connectivity issue on Android with the tips above, or do you have a solution of your own up your sleeve? Be sure to share it with the rest of the Android community in the comments right down below.